Filipino migrants were hardest hit in the recession here in New Zealand, when jobs became scarce and Filipinos who entered the country under the Work to Residence scheme found it very difficult to land a job that can earn them Permanent Residency. Changes in the skilled job category also became a challenge for Filipinos who have been in the country for a number of years to find their work visa revoked. In case you or you or a fellow Filipino you know is currently in dire straits, the KASAGIP Charitable Trust might be able to help. Acts as a liaison or link to other support providers who can provide more assistance depending on the identified need. The KASAGIP Charitable Trust quarterly garage sale is set this coming 26 June 2010. So once again, we want to inform our supportive kababayans in Wellington that we are accepting items you are no longer using and might be still useful to others. We appreciate donations of household items, clothing, small furniture, electrical appliances and others which are still in good condition and good for our garage sale in support of our Trust’s operations. Money that will be pulled together will add on to the funds that will augment our admininistration costs and other activities. with this phone number -528 5238 or email: kasagipcharitabletrust@yahoo.co.nz. We welcome and appreciate fast moving items to be donated. I mentioned in a previous post months ago that the Wellington City Libraries is providing access to a number of electronic newspapers worldwide which includes a couple from our own country. However you need a Library card in order to access these. Well, here's another way for you to get your Philippine news fix. 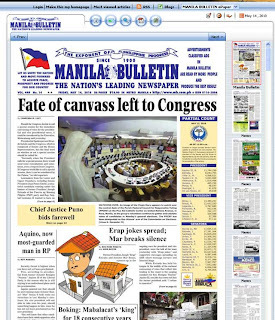 Manila Bulletin is offering its e-paper version for free! 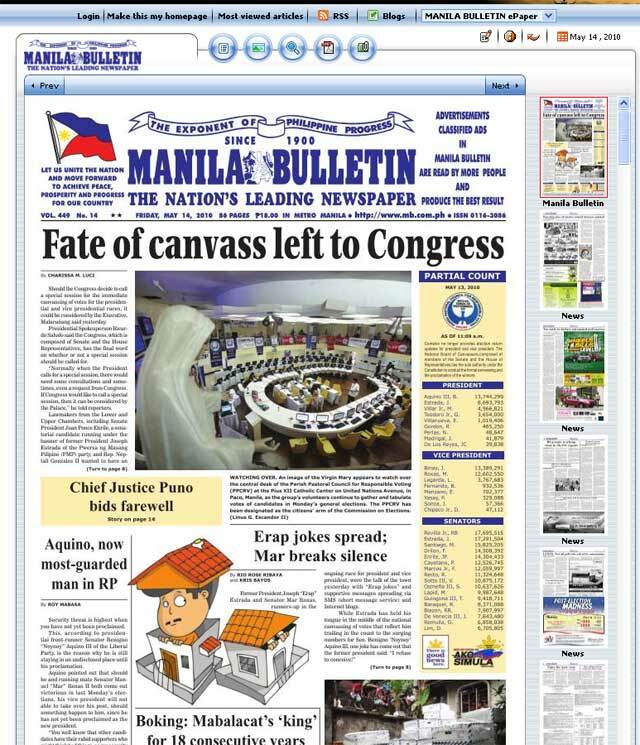 This is different from the website version in that you get the actual newspaper, advertisements, column layouts, and all. But it's not on paper. It's on e-paper! 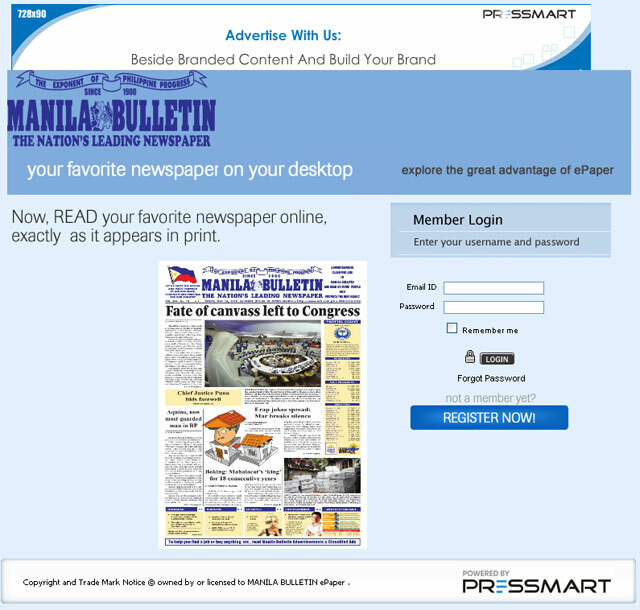 Kudos to Manila Bulletin for providing this service. Learn more at the Pressmart website. If there was one thing I missed doing back in the Philippines that I rediscovered here in New Zealand, it's the visit to the Post Office. Or the Post Shop, as they call it here. Post Offices hold a certain anticipation for me as I either send off a letter or package, all the while imagining how it will travel across oceans and how it will bring a smile to the recipient. There's a sort of build-up of anticipation that you cannot experience with the spontaneity of e-mail. The Post Shop here is rather different from the Philippines' though. For one, it provides a more diverse range of services: from banking (yes you heard it right. KiwiBank owns Post Shop), renew your car's registration, and post some mail through. But I digress. I'd like to talk about the stamps. I'm a sentimental old fool, aren't I? But buying stamps also reminded me of my colourful like as a philatelist way back in high school with two of my best friends. 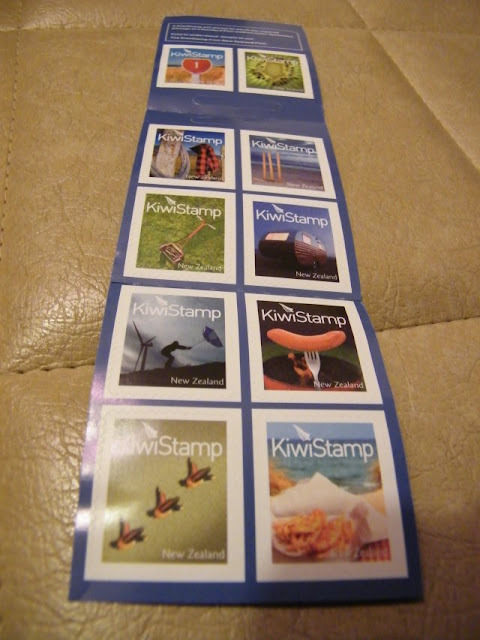 We'd scour stores that sell stamps by bulk and swap or keep them. I made my high school report based on stamp collecting (which is very memorable because I placed one of my rare German war stamps along with a valued few from my collection expecting my report to be returned, and it wasn't). Well, back to the present. My wife needed some stamps and so I bought 5 dollars worth of 50-cent stamps. And I was given this set of stamps in a booklet. I was initially puzzled about it because I did not see perforations. And then I deduced the stamps must be sticker-type. So, if they are stickers, are they qualified to be stamps? It will definitely take some getting used to. However, the "regular" stamps are still available over the counter. I tried searching for more information about these new stamps and I found this service from Post Shop: personalize your stamp! Choose a favorite photo and you can use this for your own set of stamps for a base price of $20.90 for 20 stamps! Amazing, isn't it? Now, would that qualify for a collectible stamp as well? One thing's for sure though. It would be a nifty pasalubong for friends back home who love to collect stamps! May is a fun month in the Philippines. For one, we have Flores de Mayo (Flowers of May) which is a feast dedicated to Mother Mary. And we also have Santacruzan, a procession held in honor of Reyna Helena. To be Reyna Helena is a coveted honor among the ladies. 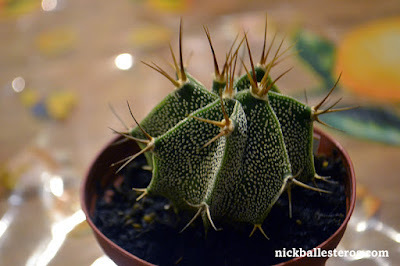 May also heralds the rainy season. After the long and hot summer, we'd finally have rains in May. It was said that the first rain in May is therapeutic. This is the one time when us kids would be allowed to play in the rain (although did not really happen much because it's cold in our hometown of Baguio!) and we sometimes stored water from the first rain to bathe in later. Well, here in New Zealand, May is the last month of Autumn. It is definitely getting colder, and the sun sets much earlier. At 6PM, it's already quite dark! I used to water the veggie patch when I arrive from work, but I sometimes find it difficult to do now because it's dark and quite cold. If the sweet peas have not been bringing me much pleasure because of their flowers and ensuing peapods, I would not think twice about staying inside the house! Well, the first of May also brought with it something else besides rain. 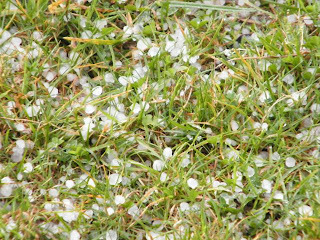 Hailstones! 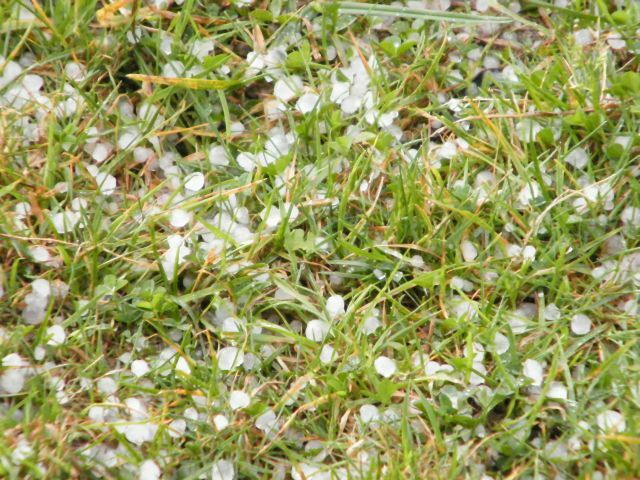 I noticed it because the rain was noisier than usual, and when I saw the raindrops seemed to be bouncing off the ground, I knew we were having hailstones. It was quite a show, and it went on for some time. I know what this means: time to bring out my gloves, mufflers and bonnets. Winter time is coming. If you are looking for the translation of this French phrase, it means "I am so afraid". And if you're looking for the translation of "Moi aussi. Vous n'êtes pas seul", it means "Me too. You're not the only one." And my guess is you've been looking for these translations because of a postcard in this week's PostSecret :-). Mike Molero and family (wife Jane and 2 children) departed from New Zealand to return to the Philippines on 30 April 2010. Although KASAGIP is still in the middle of its fund raising for Mike, Mike was able to temporarily find a sponsor to finance part of their plane ticket provided that Mike pay it back regularly when he finds employment back home. To continue supporting Mike, KASAGIP has made an agreement with Mike and decided to continue with the Kiddie Martial Arts weekend program which will run for a few more weeks with one of Mike’s tutees (Brics) as the instructor. Mike’s weekend work programme had to be cancelled. May God bless you and your family, and put you in a better position to continue to help others. If you have forwarded my initial email to friends kindly forward this email to them as well. We have a brother who needs our help. Mike Molero and his family were given up to May 2 to leave the country by the New Zealand Immigration Service. Mike came to New Zealand two years ago. Mike brought in his wife Jane and Danielle (5) early last year under favorable circumstances. Then there were changes in Mike's work arrangement that affected their positioning in New Zealand. Also, in February, new baby Victoria was born to the family. On behalf of Mike and his family I am asking for your help. We are raising a total of NZ$5,000 to fund transportation to the Philippines. At the time of writing this letter we have raised NZ$1,000. We are praying that you would help us raise the rest of the fund required. Please forward this letter to your friends. We can use all the help we can get. This request is valid up to May 2 only.